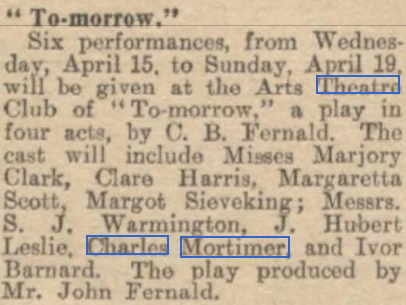 Charles Mortimer was in the cast of "Tomorrow", playing Mark Gihon, at the Arts Theatre, London, from 15 - 19 April, 1931. 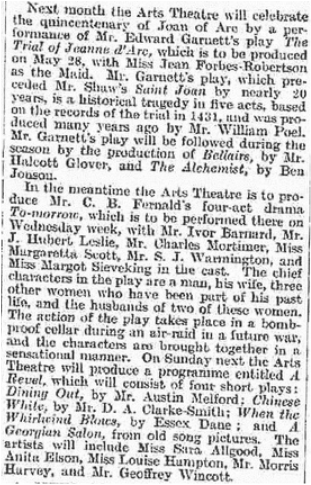 The play was set in the future, and about people in an air raid shelter. 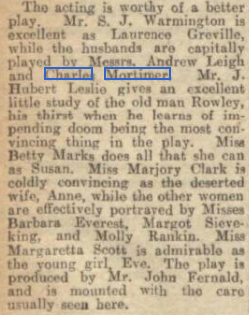 With kind permission of the Times, 6 April, 1931. From The Stage of Thursday, 23 April, 1931. From The Era of 22 April, 1931. At the Arts, a play in Four Acts by C. B. Fernald. 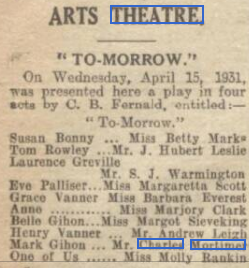 Produced the Arts Theatre Club on Wednesday, April 15, 1931. One of Us .... ... Molly Rankin. Producer, John Fernald. Mr. C. IL Fernald’s play is the kind of jejune effort which young men whose brains are teeming with tremendous thoughts on Love, Life, and Death are liable to write. We can only admire the ingenuity with which he contrives situations giving his characters almost unlimited scope to indulge in exalted thinking and moralising. First he arranges a little matter of a war. This calamity foreseen by Laurence Greville, sort of scientist-politician, who builds an underground retreat from bombs and poison gas. Here, on the fatal day, he summons his wife, two women he has loved, and a young lady with whom he is carrying an apparently platonic affair. We should have thought the average man would have preferred the tenors of the open street to the obviously impending hostilities in this underground snuggery, but Greville, like all the people in this play, has few characteristics in common with other men. While idle London crumbles to ruins upstairs, the ladies exchange amenities, Greville is unabashed and tactful, and the husbands are obtuse. Nobody betrays the slightest interest in the catastrophic affairs of the outside world. Then, to introduce a further degree of novelty, some of the poison gas begins to penetrate. This makes its victims laugh hysterically and say exactly what is in their minds. Needless to say, we are treated to some startling revelations. Finally, Mr. Fernald, who we should have thought has already stretched probability far enough, takes us to a shadowy other world, where the subterranean cocktail party, by now completely gassed and incoherent, jabber to each other a mixture of Ella Wheeler Wilcox and Sir James Barrie, before the final curtain hides them from us, or rather it seems us from them. The actors cannot be blamed for making absolutely nothing of this sad stuff. Mr. S. J. Warmington, as the unbelievable Greville, obviously lost his way from the first moment, but retained his composure throughout. Mr. Andrew Leigh afforded some relief by giving us something to laugh at, and Miss Marjory Clark, as Greville’s wife, was gloriously caustic and to the point. I almost wished she could have employed her acid tongue to tell us what she thought about the play.